We make this Hat People Newsboy Cap, with Pendleton Wool, and fully line it with cotton. 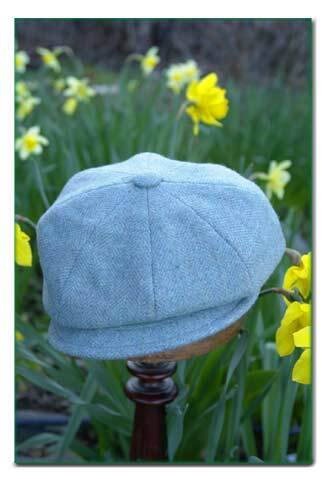 Also known as a Touring Cap or Gatsby, it can be adjusted smaller in size with an internal 9" elastic band (if the weather turns windy), and washed by hand in cold water. Pendleton calls this fabric "Cascade Blue". I would describe it as a blue herring bone with subtle shades of purple, pink, and yellow mixed into a tweed background or, to be more poetic, this wool reminds me of Rainbows in Snow on a Sunny Day. It looks great on anyone with Blue Eyes. Sizes are measured in inches of circumference and instructions describing how to measure your head can be found on our Ordering Information page. To view the difference between the Medium, Deep, Full & Extra Full Cuts please visit our Touring Cap Cuts page. Special orders can be arranged by email or by calling Hat People at (888) 930-4287. We have many more fabrics in our studio than can be shown on the web, so if you have something in mind that you don't see here, please feel free to contact us directly. A large selection of hats made for our wholesale accounts and Art Festivals are not featured online, and are always available for immediate shipment. There is no additional charge if your special hat is part of this current stock. If it is fabric swatches you seek, however, there is a $5 charge for the postage and handling of your swatches. Shipping your hat within the USA or Canada, by priority mail, is included in the price of the Hat!